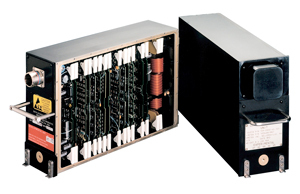 The Sentinel Instrument System Data Acquisition Unit (DAU) is a state-of-the-art, off-the-shelf data acquisition system for analog or digital processing applications where large amounts of data need to be processed or consolidated. This aircraft interface system can be configured as a single or dual-channel unit. A dual-channel configuration provides complete hardware redundancy for all parameters. Custom boards can be designed to handle specialized sensors or communications. Typical signals are filtered, converted to digital data, scaled and formatted for cockpit display or use by other aircraft systems. In addition to analog inputs, each DAU channel includes multiple ARINC 429 inputs and a RS232 interface for communications with cockpit displays, maintenance computers, flight management system, and the FADECs. All processed or stored information is transmitted through the standard ARINC 429 output bus. Optional data busses or buffered analog and discrete outputs can be incorporated into the DAU. The built-in Ethernet port can be used to output real time data or as an access point for maintenance interrogation.